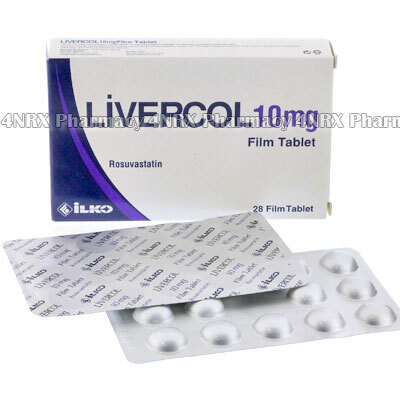 What is Livercol (Rosuvastatin Calcium) used for? Livercol is most often prescribed in cases of hypercholesterolemia (high cholesterol) to reduce the amount of bad cholesterol in the blood. Rosuvastatin decreases the amount of cholesterol produced by the liver. It inhibits an enzyme (HMG-CoA reductase) that it creates cholesterol in the liver. Rosuvastatin also helps the liver to breakdown cholesterol. It reduces total cholesterol and LDL (the bad cholesterol that increases risk of heart disease). Statins should be taken in conjuctions with improved diet, weight management, and regular exercise. This has a much more beneficial effect than taken rosuvastatin alone. How should I use Livercol (Rosuvastatin Calcium)? Livercol should be taken on a daily basis. Swallow each tablet whole with a glass of water. Most times, your doctor will start on a low dose and increase gradually as required. This will depend upon your exisiting cholesterol levels and a number of lifestyle factors. Do not change the dosage on your own, and do not stop taking Rosuvastatin unless advised by your doctor. What are the side effects of Livercol (Rosuvastatin Calcium)? When you begin taking Livercol tablets you may feel nauseous and may vomit. This is an expected side effect and should not be cause for concern. Taking Rosuvastatin after eating can help. You may also notice some sleeping difficulties. If you take the tablets earlier in the day this may help. Other common side effects you may experience while taking rosuvastatin include fatigue, headaches, and irritability. Notify your doctor of health card provider as soon as possible if you notice changes in the color of your urine or if your skin begins to yellow. These symptoms can suggest liver problems as a result of rosuvastatin. Memory loss and confusion can suggest that your dosage is too high. Ask your doctor if such problems occur. If you have a history of liver or kidney problems, you should not take Livercol. Taking rosuvastatin can make these conditions worse. You should not drink alcohol while taking Rosuvastatin. Rosuvastatin is not recommending in women who are pregnant, breast-feeding or trying to become pregnant.